New for 2018! This cozy cottage has just been added to our inventory! A perfect spot to enjoy Downeast Maine and the Acadia Region. This cozy one bedroom is perfect for a couple of small-family looking to spend their time exploring beautiful Downeast Maine. Supplied with all of the essentials for a great vacation, and within close driving distance to Acadia National Park, this is a great destination property for adventurers. Sitting just a short distance from the shore line and surrounded by forest, this cottage offers a delightful location for honeymooners or a small family looking to get away from it all. Live Lobsters and Crabs may be purchased daily from nearby Dorr Lobster Pound, also located on Bar Island or enjoy a true Maine experience and go out on the Owner's lobster boat to catch them for dinner! This is based upon availability and weather conditions. This cottage sits on the banks of an ocean inlet known as Booby’s Creek. This inlet goes inland for close to 4 miles offering some very scenic kayaking or you can head ocean ward and explore the coastline. 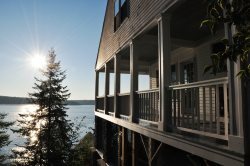 Experience the magic of living on an island and still have everything Down East Maine offers within a 1.5 hours drive. Small and private, Bar Island is connected to mainland Milbridge by a year-round causeway across Pigeon Hill Bay. At the end of the evergreen lined road is the island-studded Atlantic. The Schoodic Point section of Acadia National Park is a half hour away and is a must-see. Stop in Winter Harbor for shopping, art galleries, antiquing, lunch or dinner – or hop the ferry from Winter Harbor to Bar Harbor. You’ll cruise across breathtaking Frenchmen Bay and you’ll avoid the traffic. If you prefer, Bar Harbor, Mount Desert Island and Acadia National Park is an hour drive south through Ellsworth, Down East Maine’s premier shopping area with major retailers, small boutiques, theaters, services and excellent restaurants. And visit the Bartlett Estate Winery in Gouldsboro to taste their award-winning fruit wines. Bring a bottle home to enjoy at day’s end. Steuben is famous for Petit Manan Island, a national wildlife refuge named by Champlain just off of Bar Island. It was named such because it reminded him of the island of Grand Manan in Florida. Off the island a short distance you can take a hike up Pigeon Hill giving you beautiful views of the surrounding islands. The town of Milbridge is also historical and is your closest larger community providing shopping, a few restaurants and a historical movie theater. What to do? As little or as much as you want! Sit on the deck and listen to the tide rush in – and out. Walk along the ever-changing shore. Bike ride for hours along local roads and shore paths. Kayak from the cottage to Bois Bubert Island National Wildlife Preserve or explore Bobby Creek, Pigeon Hill Bay and beyond. Another day, drive 1.5 hours north of Bar Island to Campobello Island New Brunswick, FDR’s summer home. Or hike the trails of Quoddy Head State Park with its famed red and white striped lighthouse, the easternmost lighthouse in the U.S. A little further north is Eastport, a great exploration destination. In between are picturesque Down East Maine villages and towns, each worthy of a visit: Machias, Roque Bluffs, Jonesport and Beals, Cutler, and Addison. Internet Access: No internet. The Millbridge Library does have great internet service. The rental and the process was so easy. I would recommend On The Water in Maine to anyone! Great, pleasant customer service. Our hosts, Anne and Bill have made this a hidden paradise! Plenty of room for my nieces to run around and have fun! They loved it! The open floor plan, big windows, and beautiful views are indescribable! The Master Bedroom has plenty of space and the closets are HUGE. Comfy bed and no need to bring blankets because the house has plenty.Quiet, away from the crowds but, close enough to the attractions. All the appliances are new and updated. I kept wishing my kitchen had them! They thought of everything except a guest book. Which was ok because I was able to pick one out and start the first memory page. For future renters don't forget to share your experience. The first rays of dawn illuminate the West Quoddy Lighthouse each morning before reaching any other point in the U.S. Located in Lubec, its the easternmost lighthouse in the country. Visit Maines DownEast & Acadia Region, to see just how beautiful it is!